Two weeks ago, as I began to figure out my plans for the 2012 Essence Music Festival in New Orleans, my SPIN magazine arrived in the mail. As I flipped through it, I saw a piece on up-and-coming artist Gary Clark Jr., who, according to the magazine, was performing at more major festivals than practically any other artist this summer. He was on my short list to see and interview once I arrived in New Orleans, so I was curious to see how crazy his touring schedule was. As I looked at the festivals listed, however, I saw a glaring exception. Essence wasn’t listed as one of the festivals. 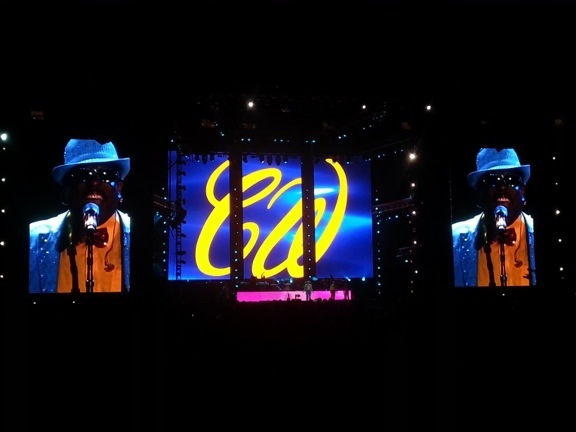 As weeks became days and the time came where I had to actually purchase a ticket to New Orleans, I asked some friends with whom I had covered Coachella or South by Southwest if they were making the trek down to Essence. I was surprised to receive very few affirmatives. As I sat on the plane, my entire thought process surrounding how to approach this festival began to change. I had originally wanted to talk about the music, the all-black lineup, and what made an act “Essence-worthy,” but now there was something deeper than that. Yes, Essence is first and foremost a magazine targeted at black women, but I had always known the festival to be a huge deal. Huge, in the sense that I knew it existed before I had ever said such made-up words as “Bonnaroo” or “Lollapalooza.” But maybe that was my black, Atlanta-based bubble making me think everyone was psyched about this every year. Now that I was beginning to understand that this wasn’t exactly true, it became my mission to get on the ground, talk to insiders and artists about the festival, and figure out why to some people it was such a non-factor and to others it was the festival. Unfortunately, that never happened. Every interview, discussion, and insider-y thing fell completely through. With that as my new reality, it looked like it was back to simply observing the music and the people. 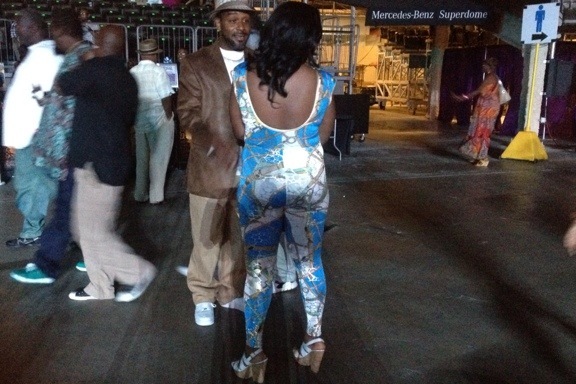 Luckily for me, the full story (and glory) of the Essence Music Festival can be told with two eyes, two ears, and two dancing feet. When I think “festival” and “dress however you want,” the immediate thought is little-to-no clothes, by way of tank tops (or no shirt) and shorts for boys and perhaps a bathing suit or skimpy get-up for girls. At Essence, it couldn’t have been more different. 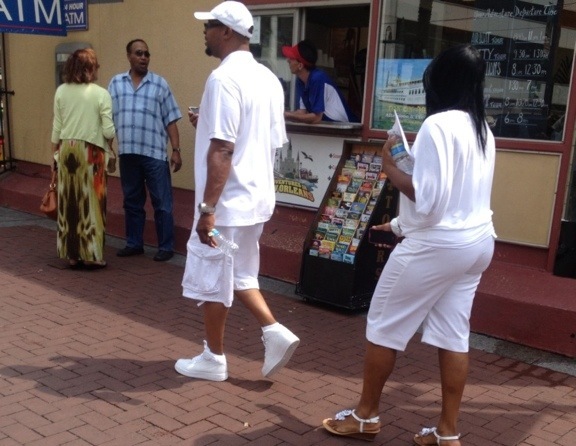 If you were in a couple, you better believe there was some kind of outfit coordination going on. Saying white was the color of the weekend is a giant understatement. Essence made Wimbledon look like a three-day goth convention. As for the women, there weren’t really any rules. More often than not, they were dressed not too differently from female attendees at other festivals, but tended to take it to the next level. You know, this level? I felt like a spy. I also felt like I was going to get in trouble every time I bought a drink, because I was convinced every third person I made eye contact with went to high school or college with my mom. When I would find myself surrounded by drunk, ready-to-party 50-year-olds, I felt like I was seeing something I wasn’t supposed to see, and they were seeing me in a way they weren’t supposed to see me. And then there was the still-unverified possibility that my mom was actually at Essence (and has perhaps been going there for the past 12 years) and just neglected to tell me. That’s the text you send to someone when you don’t want them to be in the place that you’re inquiring about, for fear that they’ll see you. Paranoid motherly digressions and self-conscious age admissions aside, it was a joy being a part of this crowd. Even though I got a few strange looks the first day because I wore a tank top and shorts (Coachella attire) to the Superdome, once I had proven myself worthy by knowing words to songs I shouldn’t know the words to, I felt as if I had been pardoned and was allowed to stay with the party people. I should have done better, though, with my clothing. I knew better. When I packed my bag, I threw in a blazer, tie, and slacks, but then laughed at myself because it was supposed to be 90 degrees in NOLA, and proceeded to take those out in exchange for some T-shirts. T-shirts. You know, the type with words and images and cool patterns. Let this be proof that horrible decisions happen when you follow The Weather Channel instead of your heart. 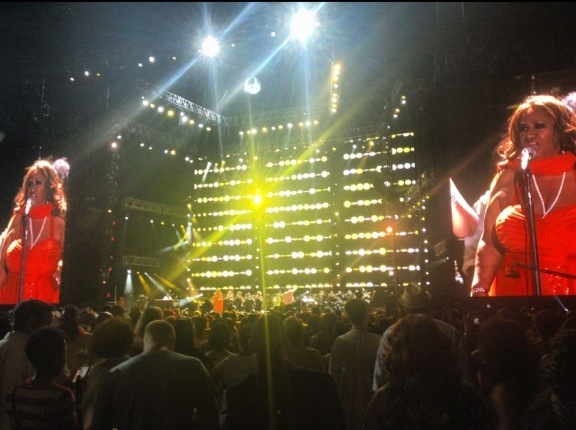 There were many acts at Essence, from the nostalgic (Dru Hill, Eve, Carl Thomas) to the rising stars (Melanie Fiona, Robert Glasper, Gary Clark Jr.). These acts, however, were held not on the main stage but in smaller venues within the Superdome. On that main stage each night were a series of acts with large followings, but they all concluded with two monster acts that could go toe-to-toe with any festival’s headliners. He is one of the main reasons I came to the festival, especially after seeing his performance at the BET Awards. When it comes to favorite artists of my childhood, especially those with classic albums, I’m often hesitant to hear new, “experimental” music for fear that it will ruin the illusion of perfection surrounding the artist. This is the well-documented story of post-Miseducation Lauryn Hill, so when news broke that D’Angelo was back with new music, I was nervous. All nerves have since subsided, because he’s unbelievable live. The unfortunate thing, however, is that I was in the minority that felt this way Friday night. For the first 45 minutes of his set, there were scattered people standing up jamming to his set, but most were sitting, almost as if this new music, filled with loud guitar and other rock influences, was an unpleasant experience. Thing I Learned About Essence Concertgoers No. 1: Not the biggest fans of change. They paid their money to see what they knew and hadn’t a care in the world for things they had yet to buy into. After performing song after song that were jams (to some of us), he sat at the piano and played one note. He played it and the crowd rose to their feet. I don’t know if they expected a shirt to come off, but for five minutes D’Angelo had the crowd in the palm of his hands. After that, he went back into his newer catalog and, and even though he had converted a few people to his side, the crowd was back to their old, bored selves. They seemed antsy. 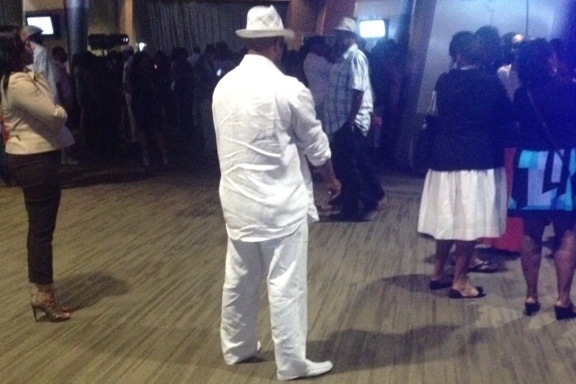 I couldn’t figure it out, because all that was left for the evening was Charlie Wilson. This wasn’t looking good. Let me be the first to say I almost left the Superdome after D’Angelo, partially because I wanted to catch up on sleep and partially because I was so bummed out by the way the crowd behaved for his set. That would have been one of the bigger mistakes of my concertgoing life, because this man Charlie Wilson put on the show of the weekend. Charlie Wilson is an interesting character, because he’s had a few important careers. First and foremost, he’s the lead singer of The Gap Band. Outside of that, he’s a solo artist with hits and then a notable background singer on songs such as Kanye’s “All of the Lights” and Snoop Dogg’s “Beautiful.” He’s a legend who has found a way to stay relevant for more than three decades. And with all of that known, I still, rudely, wanted to leave. But I didn’t, because the moment he was announced onstage, the ENTIRE crowd rose to their feet, yelling at the top of their lungs. Thing I Learned About Essence Concertgoers No. 2: They just want to dance. I can’t be mad at them for not vibing with D’Angelo, because it’s not that they hated it, it’s just that they couldn’t really dance to it. This isn’t a bebopping crowd. This is a hands-up-in-the-air, two-stepping, line-dancing group of people trying to party as hard as they have since Essence 2011. Thing I Learned About Essence Concertgoers No. 3: They just want to belt songs while they dance. “Outstanding” was the first of many examples of this over the weekend. As the time approached 1:15 a.m., Charlie looked like a man that had no intention of stopping. He was singing songs, bringing out guests, hawking his Twitter and Facebook pages, and telling us where to buy his signature “CW” fedoras. And if that wasn’t enough, he started preaching. Thing I Learned About Essence Concertgoers No. 4: They love being up-tempo preached at. Charlie told a story about how he went “rags to riches to rags,” including selling drugs and being homeless. And then he brought up Jesus, an organ started, and again, the crowd was his. He could do no wrong on this night, and as I’ve learned speaking to people who have seen him in the past, he can’t do much wrong, period. I have been asked on numerous occasions, “Why do black people love Kevin Hart so much?” It’s a good question, one that I don’t have a quick answer to, but I know it to be true and I happen to be someone who also likes him. For me, he’s established himself as next in line in the black superstar stand-up comedian lineage. While it’s not always true, there usually has been one guy that has held the title for a few years, until replaced by someone else. Before Hart, Katt Williams had it for a minute. Chappelle, for a longer minute. Rock for a good while. Mac, Lawrence, Tucker, and Harris for a few seconds. Eddie for the ’80s, and then everything else is a mix of Pryor, Foxx, and Cosby. Right now is Kevin Hart’s moment. His arena-packing moment. 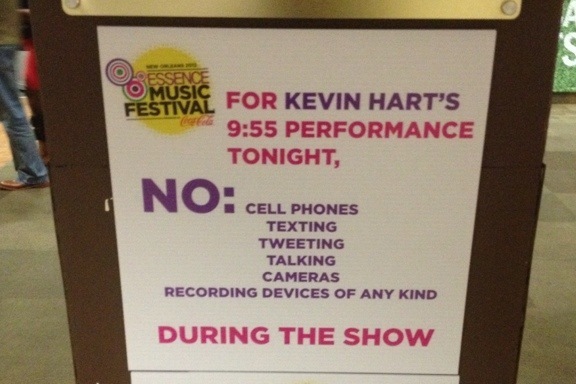 Kevin Hart fills stadiums the way the Kings of Comedy used to, all by himself. He’s a rock star. And he didn’t disappoint. His stories all tend to revolve around three worlds: being a father, dealing with women, and being short, but the stories are hysterical. Also, every time he finished a good story, he did a James Brown “two times” gesture and flames shot up from the stage. Just fantastic. It was great, mainly because he knows he’s the only one who can get away with stuff like that right now. I knew he had it when I attended the 2012 NBA All-Star game and he had a tendency to pop up everywhere, to the joy of all in attendance. At times, it was kind of hokey to me, but everyone around me seemed thrilled to see him crash yet another All-Star-related event. When the same shtick kept working over and over again, I knew he could do no wrong in the eyes of his fans, who are predominantly black. Unlike the previous night, in which the crowd went from 0 to 60 in a matter of seconds when Charlie walked onstage to replace D’Angelo, the transition from Hart to Mary J. Blige was 60 to 200. But that’s only to be expected, because she’s the Queen. So Mary does this dance, and it’s really awesome because it’s become her signature shuffle. There are slight variations to it, but basically it’s b-boy box step, complete with outward arm thrusts that change from step to step. In the beginning of the move, she thrusts at you, almost confrontationally, but then the second part of the move is her pulling back, almost articulating “I mean no harm, j/k.” I think this is why I’ve taken on the move so much in my life, because few things sum me up more than “You want some?” closely followed by “Oh no, I wasn’t talking to you, sorry for the confusion.” It’s amazing. She’s been doing this move for 20-plus years now, which I think is phenomenal because she can’t really dance that well. She’s pulled off choreography in videos here and there, but she doesn’t really need to, seeing as that she has that Mary J. shuffle. Mary also performed songs. A lot of them, and they were all good because she’s Mary J. Blige, a big bag of emotions, and uses performances to get the feelings out. When she (and all of the women in the crowd) powered through her most emotional section of the program (“I’m Goin’ Down,” “My Life,” “No More Drama”), she was exactly how I’d envisioned her all these years, always a few seconds away from seemingly breaking down into tears. She never did, but watching her always on the brink almost took me there. The best thing about Mary’s performance, though, beyond the songs and the shuffle and the fact that she does everything in those tall Mary boots with those enormous Mary heels, is that after every song she said “Thank you.” After I noticed she’d been doing this eight or nine songs in, I was worried that she was finishing up early. When I realized that she was thanking us for every single thing she did onstage, I was completely won over. She’s marvelous. When it became clear that Chaka Khan was closing Essence over Aretha, I was confused and angry. I love Chaka, but come on, Essence. Aretha, second fiddle? Didn’t make any sense at the time. And then “the time” happened and it made perfect sense. I love Aretha, but she’s gotten to that point where every public appearance becomes a (potentially deserved) tribute. Aretha could perform at a bowling alley at this point and they would change the name of the establishment to “Chain of Fools Lanes” and dedicate a red “RESPECT” bowling ball in her honor. Couple this with the fact that she’s the biggest diva of all time and hilarity ensues. After a small set, Aretha walked offstage and a long photo montage of Aretha’s career landed on the monitors, complete with interviews and testimonials. After that, a few people, including the editor-in-chief of Essence, the lieutenant governor of Louisiana, and the mayor of New Orleans, came out to talk more about her and give her the key to the city, as well as some other accolades. After this, Aretha came back onstage and, not knowing that this long tribute has taken place, introduced them and told them to come onstage because they had something to give to her. So they come back onstage, do their best job at pretending like this is the first time this has happened, as does the crowd, who clap loudly for a second time. Hilarious. After a few more songs, Aretha (now past the time that she was supposed to end) takes the piano and starts into “I Will Always Love You.” A Whitney tribute from Aretha? Can’t beat that, right? Well, yes, actually, especially when the slideshow goes from photos of Whitney to pictures of Aretha. And then, from pictures of Aretha to pictures of her with Obama, random friends, and her solo images of her niece. And then she started calling out people in the audience that she knew, telling them to stand up. Some weren’t even there, but she gave them a few seconds to show themselves anyway. It was like those three Sundays a year when I’m home in Atlanta and my uncle, who is a pastor, gives me a shout-out, but instead of a room of 200, it’s the Superdome, mid-music festival, and everyone here is a paying customer. It made perfect sense why Aretha wasn’t performing last. The songs she sang were great, because her voice still sounds great, but the crowd never got into it like you’d expect. Maybe it was the fact that she went an hour over, maybe it was the stunts she was pulling, or maybe it goes back to Essence Audience Observation No. 2: They just want to dance. 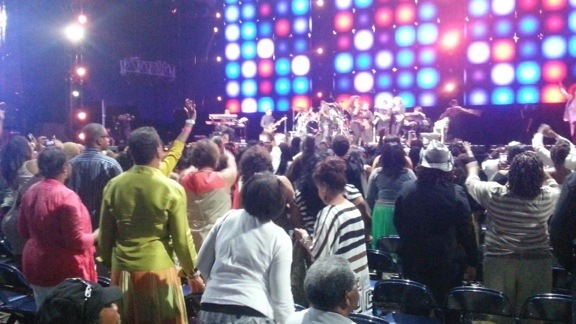 No one could really dance to the songs Aretha was playing, and the crowd was on their D’Angelo behavior again. When Aretha finally left the stage, a good portion of the Superdome had cleared out because they either assumed that was the finale or because it was about to become Monday morning. Even to those of us who had no intention of leaving, there were some doubts as to whether Chaka would even come out anymore. Another tribute took place, with the likes of Faith Evans and Monifah singing songs of those who had passed in the last year. After 15 minutes of that — finally — we got our Essence Finale. It was Friday night all over again. The second that redheaded, Pam Grier–looking beaut strutted onstage, the crowd was back for one final dance party. Chaka, like the two previous headliners, Charlie and Mary, was ready to work hard on that stage for her audience — and she did not disappoint. She’s great for many reasons, but one of those reasons is that you can see so much of her in the other female singers that have come after her. She’s been covered by the likes of Whitney Houston (“I’m Every Woman”), Erykah Badu (“Stay”), and Mary J. Blige (“Sweet Thing”), and between the tributes dedicated to Whitney and the career trajectory (and phenomenal stage presence) of the other two women, it’s clear she is one of the prototypes to whom funky female singers measure themselves. When Erykah wails at the top of her lungs effortlessly, that’s all Chaka, and when I watch Chaka also not really be able to dance, it’s so clear that’s where Mary got it from. She went through all of her (or Rufus’s) hits with the exception of “Through the Wire,” (possibly because there seemed to be someone telling her to wrap up the show from the wings). Even still, she closed it out in perfect fashion, and we, the crowd, went there with her, losing our voices one last night for another phenomenal headliner. The Essence Festival may not be on everyone’s radar, but it should be. You’re not going to get much better entertainment than D’Angelo, Charlie Wilson, Kevin Hart, Mary J. Blige, Aretha, and Chaka Khan as headliners, in addition to all the other acts. Will I go next year? Most likely, but if so I will have to make some major changes in my life, namely the acquisition of a lot of white linen, color-coordinated ensembles, and straw fedoras. If I can get over my fear of looking like myself in 10 years, then yes. 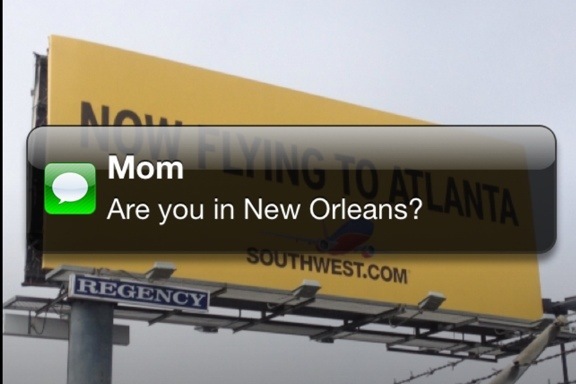 I’m there. 100 percent.